An undesigned page of timeless adland wisdom. 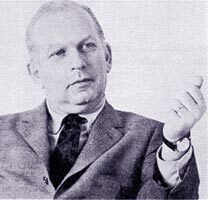 The giantest of all adland giants, nobody has ever understood advertising better than William “Bill” Bernbach. The quotes herein are taken from various speeches and interviews that Bill gave over the course of his life. And although he made these observations waaaay back in the late 50s and early 60s – when digital meant something done with your fingers – they are as true and as relevant today as ever. Enjoy! It took millions of years for man’s instincts to develop. It will take millions more for them to even vary. It is fashionable to talk about CHANGING man. A communicator must be concerned with UNCHANGING man, with his obsessive drive to survive, to be admired, to succeed, to love to take care of his own. Is creativity some obscure, esoteric art form? Not on your life. It's the most practical thing a businessman can employ. You can turn a page and, before you really comprehend it, there’s a feeling. There’s a vibration. If it’s the wrong vibration for what you want to convey, what follows is going to fight it – an uphill battle against the original impression you made. The magic is in the product. Surely it is better to state our proposition with the kind of talent that will touch and move the reader and viewer than to bore them to death with the ordinary. Merely to let your imagination run riot, to dream unrelated dreams, to indulge in graphic acrobatics and verbal gymnastics is NOT being creative. The creative person has harnessed his imagination. He has disciplined it so that every thought, every idea, every word he puts down, every line he draws, every light and shadow in every photograph he takes, makes more vivid, more believable, more persuasive the original theme or product advantage he has decided he must convey. You can get attention and really make people resent you if you do it with an unrelated gimmick. They won’t like you for that. I can put down on a page a picture of a man crying, and it’s just a picture of a man crying. Or I can put him down in such a way as to make you want to cry. The difference is artistry – the intangible thing that business distrusts. You can have everybody coming in on time, everybody leaving on time, all work finished on the due date, and still have a lousy ad, and fail. It is one thing to have a selling proposition and quite another to sell it. Technique for its own sake can be disastrous. Because, after a while, you’re so anxious to do things differently, and do them better and funnier and more brilliantly than the next guy, that that becomes the goal of the ad, instead of the selling of the merchandise. It’s that creative spark that I’m so jealous of for our agency and that I’m so desperately fearful of losing. I don’t want academicians. I don’t want scientists. I don’t want people who do the right things. I want people who do inspiring things. Just because your ad looks good is no insurance that it will get looked at. How many people do you know who are impeccably groomed – but dull? We are so busy measuring public opinion that we forget we can mold it. We are so busy listening to statistics we forget we can create them. We don’t do just snob ads, we don’t do just short copy ads, or just long copy ads, or any particular style. If you want to know what makes DDB ads, it is a fresh and original idea that conveys the advantage of the product memorably. We have no formula. I wouldn’t hesitate for a second to choose the plain looking ad that is alive and vital and meaningful, over the ad that is beautiful but dumb. Our job is to sell our clients’ merchandise, not ourselves. Our job is to kill the cleverness that makes us shine instead of the product. Our job is to simplify, to tear away the unrelated, to pluck out the weeds that are smothering the product message. Know your product inside out before you start working. And relate that knowledge to the consumer’s needs. There will be a time when no headline is proper; there will be a time when a headline is proper. There will be a time when a logo is good and there will be a time when using a logo is the worst thing in the world you can do. No matter how skillful you are, you can’t invent a product advantage that doesn’t exist. And if you do, and it’s just a gimmick, it’s going to fall apart anyway. A great ad campaign will make a bad product fail faster. It will get more people to know it’s bad. Forget words like hard sell and soft sell. That will only confuse you. Just be sure your advertising is saying something with substance, something that will inform and serve the consumer, and be sure you’re saying it like it’s never been said before. Adapt your techniques to an idea, not an idea to your techniques. Playing it safe can be the most dangerous thing in the world, because you’re presenting people with an idea they’ve seen before, and you won’t have impact. The difference between the forgettable and the enduring is artistry. You’ve got to live with your product. You’ve got to get steeped in it. You’ve got to get saturated with it. You must get to the heart of it. Indeed, if you have not crystallized into a single purpose, a single theme, what you want to tell the reader, you CANNOT be creative. There are two attitudes you can wear: that of cold arithmetic or that of warm, human persuasion. I will urge the latter on you. For there is evidence that in the field of communications the more intellectual you grow, the more you lose the great intuitive skills that make for the greatest persuasion – the things that really touch and move people. Can you really judge an idea from a storyboard? How do you storyboard a smile? Execution becomes content in a work of genius. Don’t confuse good taste with the absence of taste. It is insight into human nature that is the key to the communicator’s skill. For whereas the writer is concerned with what he puts into his writings, the communicator is concerned with what the reader gets out of it. He therefore becomes a student of how people read or listen. To succeed, an ad (or a person or product for that matter) must establish its own unique personality or it will never be noticed. To keep your ads fresh you’ve got to keep yourself fresh. Live in the current idiom and you will create in it. If you follow and enjoy and are excited by the new trails in art, in writing, in industry, in personal relationships – whatever you do will naturally be of today. Find new symbols, even though in time those symbols will grow old and die. The most freshly sculptured phrase will eventually become a cliché. There is practically nothing that is not capable of boring us. With our industry being watched so carefully by governmental agencies, with the FTC ready to pounce on every claim we make, what we CAN say in our ads is forever narrowing and the sharpest tool left for is HOW we say it. Dullness won’t sell your product, but neither will irrelevant brilliance. You’ve got to believe in your product; you’ve got to believe in your work. Only a deep belief will generate the vitality and energy that give life to your work. You cannot sell a man who isn't listening. Maybe we’re getting bogged down in too much detail. Maybe our advertising ideas are being ground up in that multi-level American efficiency machine. Getting a product known isn’t the answer. Getting it WANTED is the answer. Some of the best known product names have failed. It’s not how short you make it; it’s how you make it short. The great mistakes are made when we feel we are beyond questioning. Logic and overanalysis can immobilize and sterilize an idea. It’s like love – the more you analyze it the faster it disappears. Today, everybody is talking ‘Creativity,’ and frankly, that's got me worried. I fear lest we keep the good taste and lose the sell. I fear all the sins we may commit in the name of ‘Creativity.’ I fear that we may be entering an age of phonies. A unique selling proposition is no longer enough. Without a unique selling talent it may die. The fragile structure of logic fades and disappears against the emotional onslaught of a hushed tone, a dramatic pause, and the soaring excitement of a verbal crescendo. Working from a method or a formula is guaranteed to do the same thing to the effectiveness of an idea that time does to a loaf of bread. Ideas must be hot out of the oven if they are to arouse the appetite. That is why, in communications, imitation is commercial suicide. An important idea not communicated persuasively is like having no idea at all. The men who are going to be in business tomorrow are the men who understand that the future, as always, belongs to the brave. It is ironic that the very thing that is most suspect by business, that intangible thing called artistry, turns out to be the most practical tool available to it. For it is only an original talent that can vie with all the shocking news events and violence in the world for the attention of the consumer. We don’t ask research to do what it was never meant to do, and that is to get an idea. However much we would like advertising to be a science – because life would be simpler that way – the fact is that it is not. It is a subtle, ever-changing art, defying formularization, flowering on freshness and withering on imitation; where what was effective one day, for that very reason, will not be effective the next, because it has lost the maximum impact of originality. More and more I have come to the conclusion that a principle isn't a principle until it costs you money. If you stand for something, you will always find some people for you and some against you. If you stand for nothing, you will find nobody against you, and nobody for you. Every last bit of this web site conceived, coded and © 1994 – 2019 by craig cooper except all the stuff Bill B said, of course.